Lots to celebrate and take note of! 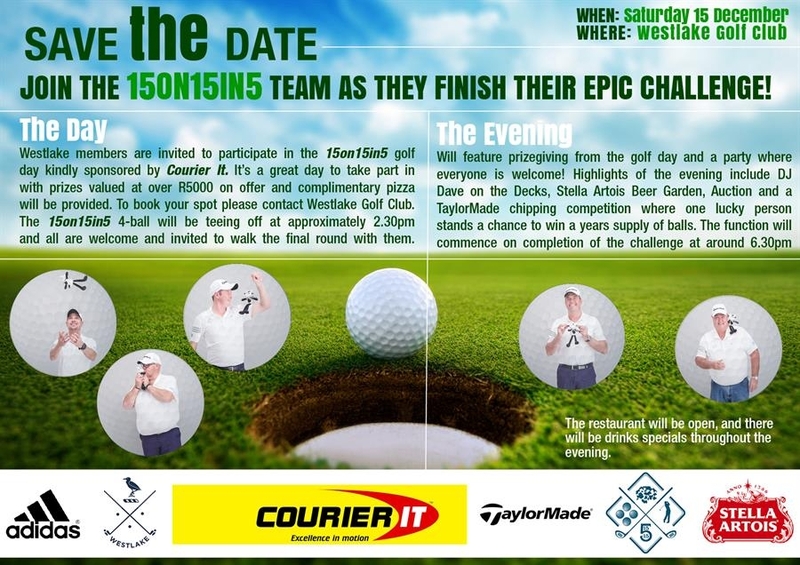 Next Saturday the 15th December is the culmination of the eagerly anticipated 15on15in5 fundraising venture. 4 golfers will be playing 15 different courses in just 5 days with the final round here at Westlake, followed by ahuge party! Prizegiving will be a little later than normal, but we ask all the regular Saturday golfers to stay and enjoy all the festivities. There are really great prizes up for grabs. Have a look at the attachment for more info. The 4 ball taking on this monster challenge includes our own Brent Lyall and Robbie Larson. The cause is worthy of your support. See everyone here next Saturday for a great function and party. The R10K draw is happening this Friday, 7th December. It will be upstairs as normal. See you all there for the final R10k draw of 2018! Saturday is a big day, with regards to sponsors. Eagle lighting are sponsoring the morning field and there arebig prizes up for grabs! Young Turks sponsor the afternoon field along with Basillico and once again there are some great prizes available. Our lady President, Annemarie Usher, along with all our ladies, are holding a very special Christmas party for the children of the Caddies and Greenkeeping staff at 15:00 on Saturday afternoon. This will be held on the driving range, so the range will be closed after 13:00 to accommodate this lovely enterprise. Thank you to the ladies for an amazing effort! Each child will get an individually wrapped present, and there will be a jumping castle and all sorts of other surprises for the kids. Next Tuesday is a busy day. The WAGS are holding their Christmas Competition and lunch in the morning, and our ladies are having their Christmas party that evening after their golf. Speaking of the ladies, they held their annual prizegiving on Tuesday night and it was very well attended. The standard of golf in the ladies section is improving in leaps and bounds and their Early Birdies and Bunnies programmes are reaping real benefits. We will be extending the idea to include gentlemen now too, so if anyone knows any gents keen to give golf a try, but unsure or intimidated by the whole “club” experience, they can contact me or watch the newsletter for more info. 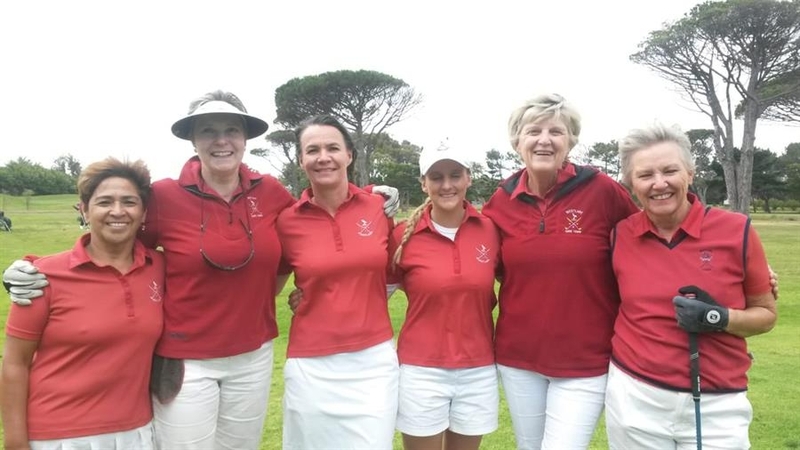 In the Ladies leagues our Silver 2 team, captained by Sonja Sleep, had an incredible year and were the most successful team in the League throughout 2018, finishing with the most points. As a result, they were seeded 1st for the eight team play-offs. They beat Erinvale in the quarter finals, Strand in the semi-finals and sadly lost to Durbanville in the final, played last week at Royal Cape. Below is the team photo of the finalists – Fahiema Enous, Julie Dyer, Nancy Dorrat, Alison Bourne, Sonja Sleep, Pam Mouries. Well done ladies – this is a massive achievement. 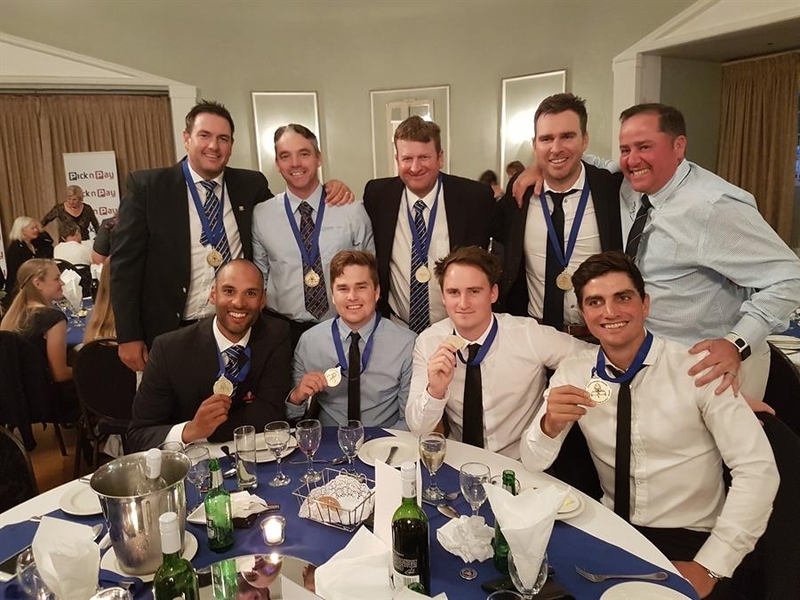 Our 2 Men’s winning League sides were honoured at the annual Western Province awards dinner held at Kelvin Grove on Wednesday evening. Well done once again to the Premier League and First League sides for an outstanding season. Elton James also won numerous awards with Sean le Roux won and Sonja Sleep also being honoured. At the time of writing the details and photos weren’t available but we will include all details in next week’s newsletter. Well done to you all, you made us all very proud! Speaking of Leagues, a reminder that anyone interested in playing Masters or Mid-Amateur League for the club next year can put their name down on the lists in the foyer. These Leagues start at the end of January. Give it a try! Hamper Day was held on Sunday afternoon. This is always a popular Mixed Competition. 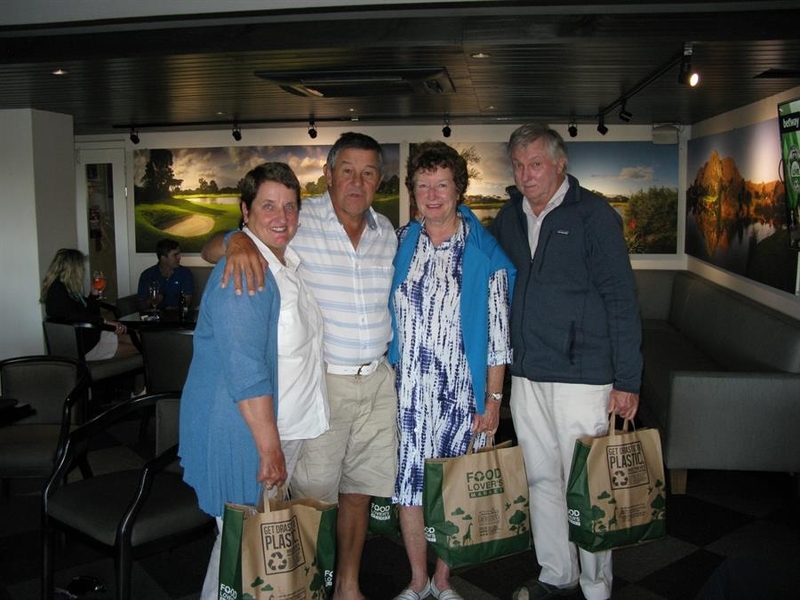 Well done to Denise Higgenbottom, Alistair Simmonds, Alison and Simon Gilbert who were the winners. All Wednesday bookings for the 19th and 26th December as well as the 2nd and 9th January will be done on Monday 10th of December. This is due to public holidays on all the Mondays over the following 3 weeks. Please ensure you keep this in mind and book your Wednesday games for all 4 weeks on Monday. Bookings for Saturday afternoons will now open at 17:00 the preceding Friday starting from Friday 14th December to the following Saturday 22nd December. 2. Physically at the club reception as in the past. for those members who do not have internet access and need assistance with their bookings. – The 26th December will not be an American Scramble as shown in the diary, but a 4BBB Stableford. – Finally, bookings for New Year’s Day will open this Friday. The club always opens slots from 12:00 to 13:00 on 1st January. We always have some members who like to play, so book your slots now and secure your place. Amanda – Reception, weekly bookings, handicap enquiries, club account queries and entering scores. Carmen – Advanced bookings, group bookings and basic membership enquiries. Emelia – Corporate days, tournaments, events and functions and more complex membership matters. The Golf RSA Handicap System and the World Handicap System, when it is introduced into South Africa in 2020 – specifies that all valid scores, including No Returns, should be entered on the system as soon as possible after the round has been played. While the system allows a period of 72 hours before allocating a penalty score, golfers should be aware that, as per the Golf RSA Handicap Rules, golfers are obliged to enter the score before the next round is played. The 72-hour period is the time allowed before a penalty is applied, which is usually the lowest score in the player’s last 20. Yet, as per the rules, it cannot be used to delay entering a score, and a player should not be allowed to enter a club competition if they have a outstanding score entry. Have a great week and see you all at the club this weekend.